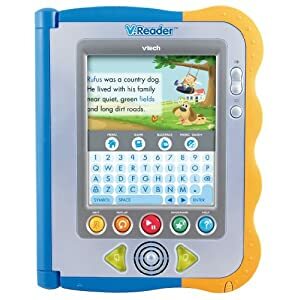 If you’re looking for a product to help your aspiring young reader this holiday season, then check out VTech’s V. Reader Animated E-book Reader System. What exactly is the V. Reader? Think Kindle but for the preschooler and in color and much more fun looking. This digital interactive toy allows kids to interact with stories – stories can be read aloud and children can engage in story reading by answering questions and playing games after the story is over. The suggested age on this toy is ages 3-7. At first I felt like this was a wide age range but then I realized that there are different modes and settings. In other words, my 4 year old would be doing the basic story-reading while my 6 year old can play phonics and word recognition games. It retails for $59.99 – you can get it on Amazon for $54.00 with free shipping. Disclaimer: VTech provided me with a sample V. Reader to facilitate this review. Hi there, I have been reading your site for a long time and I finally just joined..Thank you!